Paul Turnbull's major claim to fame is the authorship of TNT Evilution's MAP23, "Lunar Mining Project", a level noted for feeling out of place in the scheme of the megaWAD being as it's a pretty concrete man-made level in the ostensibly Hellish third episode. It's also noted for having a few of those odd custom textures that some people find questionable. 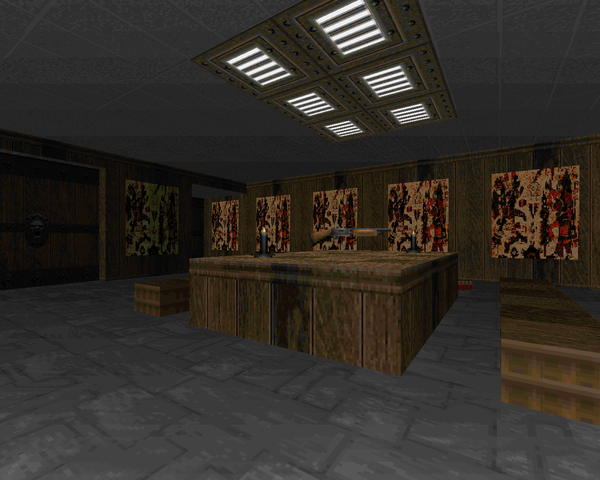 His other contribution to the Doom community is Mayan Temple, an E1M1 replacement released back in '94, which being a standalone work doesn't fall prey to the first complaint. The second, though, is fair game as Turnbull has included a host of brand new textures to help establish his theme. It's some kind of Mayan temple, of course, or more accurately a block of Mayan architecture with conflicting inclusions of Egyptian iconography.